Burning waste, especially plastics can have serious health implications. Despite all efforts to educate people there are still some who insist on burning waste instead of disposing of it in an environmentally friendly - and legal - manner. While there is a perception out there that this poses no real harm, the reality is that by burning waste, especially plastics, you are not only releasing dangerous toxins into the air, you are putting the lives of yourself and your family and your neighbours at risk of developing cancer and other serious diseases. The most dangerous emissions can be caused by burning plastics containing organochlor-based substances like PVC. When such plastics are burned, harmful quantities of dioxins, a group of highly toxic chemicals are emitted. Dioxins are the most toxic to humans. They are carcinogenic, act as hormone disruptors - impacting fertility - and accumulate in our body-fat. Dioxins also settle on crops and in our waterways where they eventually wind up in our food, accumulate in our bodies and are passed on to our children. Think about that plastic milk carton you throw into the range, or that plastic drink bottle you throw on a fire in the backyard. Each and every time you are burning this, you are causing harm to yourselves and your family. That is a fact. Remember, air emissions from home burning are released directly into the house or the atmosphere without being treated or filtered. Toxins released can increase the risk of heart disease, aggravate respiratory ailments such as asthma and emphysema, and cause rashes, nausea or headaches, damage to the nervous system, kidney or liver, as well as damage the reproductive and development system. The burning of polystyrene polymers - such as foam cups, meat trays, egg containers, yogurt and deli containers - releases styrene. Styrene gas can readily be absorbed through the skin and lungs. At high levels styrene vapor can damage the eyes and mucous membranes. Long term exposure to styrene can affect the central nervous system, causing headaches, fatigue, weakness, and depression. What happens when you burn rubbish in your back yard? Pollutants released from burning plastic waste in a burn barrel are transported through the air either short or long distances - depending on the wind - and are then deposited onto land or into bodies of water. in the environment and have a tendency to bio-accumulate which means they build up in predators at the top of the food web. Bioaccumulation of pollutants usually occurs indirectly through contaminated water and food rather than breathing the contaminated air directly. immune diseases and subtle neurobehavioral effects. Humans can be exposed indirectly just like wildlife, especially through consumption of contaminated fish, meat and dairy products. Don't burn rubbish - it's as simple as that. Burning attracts fines of up to €3,000. There are recycling facilities where it is safe to dispose of items such as plastic containers. Think of the health of your family, friends and neighbours, don't burn rubbish. 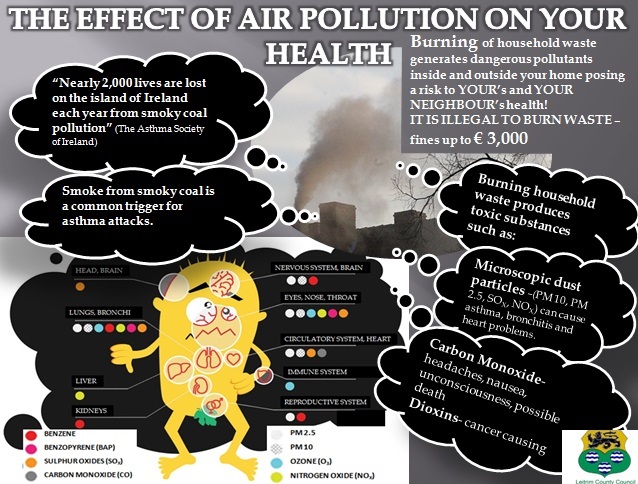 *Information courtesy of 'Dangerous Health Effects of Home Burning of Plastics and Waste' by Women in Europe for a Common Future and Leitrim County Council.